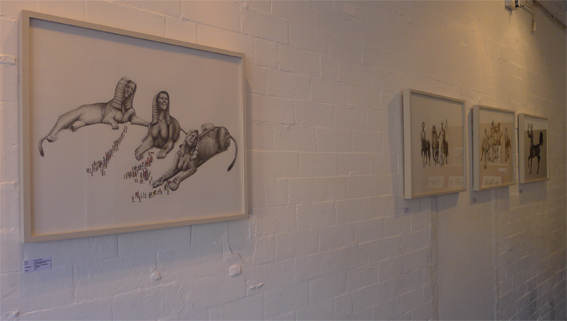 In March 2013 we opened a solo show from one of our Team Recoat members, Kirsty Whiten. She revisited her Schemie Centaurs Imagery to create a new series of drawings, paintings, and paste-ups. Her work focuses on reconstructing myth and imagining awe-inspiring creatures of old in a modern context; centaurs - half man, half horse, heroic and muscular, caught up in the trenches of WW1, or even the backstreets of Glasgow, where they sport baseball caps, down bottles of beer and flick the V's at us. Kirsty has exhibited all over the world from London to New York and Melbourne. Her last show, Breeder Badlands, was at Stolespace in London and led to a series of lithographs co-published by Edinburgh Printmakers Workshop in 2012. Her warped imagery has been featured in magazines such as Juxtapoz and Hi Fructose and art blogs worldwide. Her massive paste ups were an important part of the Rough Cut Nation installation at the National Portrait Gallery and at their recent Freedom Versions in Stirling.